Heritage Builders is pleased to unveil its latest West of Trail offering, The Antigua II. Located at 1572 Eastbrook Drive, this four bedroom, four and half bath residence is situated on a stunning, tree-lined non-through street in Sarasota's coveted West of Trail neighborhood. The Antigua II brings sophisticated West Indies styling, complemented by a casual and open floor plan. Chef's grade appliances, custom cabinetry, hardwood floors, opulent counter tops and sparkling pool and spa continue to set the standard for custom homes. For more information about the Antigua II, please call us at 941-328-3272. Heritage Builders is the finest custom home builder in Sarasota, Florida. Heritage Builders provides new home design services and a variety of portfolio custom home designs to choose from. Heritage Builders recently closed the sale of its latest West of Trail masterpiece in Sarasota. This custom West Indies inspired residence features four bedrooms, four and a half baths, TV Room, Study, three car garage and more. Owners are welcomed by a locally crafted mahogany entry door and voluminous vaulted ceilings. A chef's grade kitchen is the backdrop to an inviting Great Room and Dining Room with vistas of the lushly landscaped yard and custom pool and spa. A luxurious Owners' Suite with tent-vaulted ceiling leads to a elegant Owners' Bath, with Italian porcelain tile flooring and free-standing tub. Heritage Builders is the preeminent custom home builder in Sarasota. Please call us at 941-328-3272 for more information about our offerings. The Antigua custom home is nearing completion with delivery in November 2017. This stunning residence features an original West Indies architectural design. Its vast interior spaces are all on one level. Visitors are greeted by expansive pocketing sliding glass doors upon arrival through the hand-crafted mahogany entry door. A tented vault ceiling with impeccably stained wood adds volume and grandeur to the Great Room. The open concept features a chef's grade kitchen and casual dining area situated at the rear of the home, overlooking the custom pool and spa. Owners enjoy a decadent Owners Suite featuring an opulent Master Bathroom with free standing tub and quartz counter tops. The Antigua has a total of four bedrooms, four and a half bathrooms and three car garage in 3,773 square feet of living area. The home is located in the coveted West of Trail area at 4035 Camino Real in Sarasota. Please call Leif Schmidt at 941-961-3324 for more information about The Antigua. Heritage Builders is Sarasota's finest custom home builder. We pride ourselves in conceiving and delivering high quality homes with thoughtful designs. Heritage Builders is excited to unveil the Sandhill Lake Preview Center. Community construction at the Sandhill Lake Community is now underway, with a projected completion date of Spring 2018. In the meantime, please feel free to visit the Sandhill Lake Preview Center, conveniently located at Heritage Builders' Ashton Oaks community, located in central Sarasota and only minutes from the Sandhill Lake site. The Sandhill Lake Preview Center is housed in the Magnolia model, which can be built on a lot of your choice at Sandhill Lake. Heritage Builders is now taking reservations for Sandhill Lake, with model and new homes delivering in Spring 2018. Please call us at 941-234-0432 or register below for more information. Enter through the Ashton Oak community gates. The Preview Center is the first house on the right. The Islamorada custom home located in the coveted West of Trail location in Sarasota has sold. This stunning, island inspired residence has four Bedrooms, four and a half baths and three car garage. The Islamorada features custom hardwood cabinetry, wood floors through main living areas and Owners Bedroom, luxurious tile flooring in wet areas, custom pool and spa, outdoor kitchen and more. The Islamorada can be built on your lot. Heritage Builders, Sarasota's finest custom home builder, also offers design-build services if you wish to customize your residence. Please call us at 941-328-3272 if you would like to discuss building opportunities. Ashton Oaks 95% Sold! Just One Opportunity Remains to Customize Camillea Model. With three sales in just two weeks, Ashton Oaks is now just one home from sellout. Heritage Builders recently broke ground on a Camillea model on a corner lot in Ashton Oaks, Sarasota's finest new home community. Please call 941-328-8272 to learn more about living in Ashton Oaks and how to take customize the last remaining home in this private, gated community. Please visit AshtonOaksSarasota.com for more information. Ashton Oaks Approaching Sellout - 80% Sold! There are but four opportunities left at Ashton Oaks in Sarasota, Florida. This private enclave in the heart of Sarasota is home to just 20 customizable residences. All four remaining homes are under construction with quick deliveries. Please call us today for more information about the limited opportunities at Ashton Oaks. Sarasota's premier luxury custom home builder, Heritage Builders, invites you to join us to learn about Sandhill Lake, our newest private, gated community. Sandhill Lake is ideally located in central Sarasota and offers only 34 single family residences ranging from 2,400 to 3,400 square feet. This exclusive unveiling celebration will be hosted at the Magnolia Model in Ashton Oaks located at 5005 McIntosh Road, Sarasota, FL 34233. To learn more about the available opportunities and pre-construction pricing, please RSVP to Info@SandhillLakeSarasota.com or call 941-234-0432 to speak with an Associate. Ashton Oaks by Heritage Builders 75% Sold! Heritage Builders is pleased to announce that 75% of the homes at Ashton Oaks have been sold. Limited opportunities remain to live in Sarasota's newest gated, private community of just 20 single family residences. Quick delivery homes are available as soon as July 2017. West Bay by Heritage Builders - Ground Breaking! 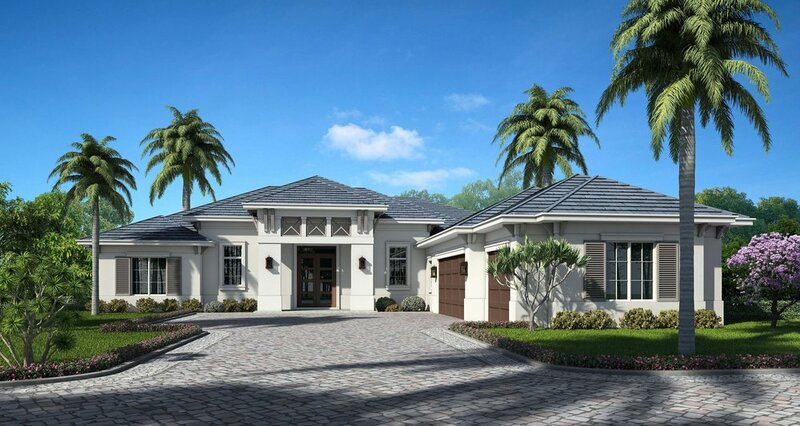 Heritage Builders, Sarasota's preeminent luxury custom home builder has broken ground on it's West Bay Community. Ideally situated in Sarasota's most coveted West of Trail area, West Bay is a private, gated community of just 4 Coastal and West Indies inspired single family residences. As one of Sarasota's finest home builders, our knowledgeable team of building professionals will ensure that only the best in quality materials and construction practices are used for every home. The Estates at Red Rock - Sold Out! The Estates at Red Rock is comprised of 3 over size home sites, 2 of which are over one acre and situated on Sarasota's inter-coastal waterway. 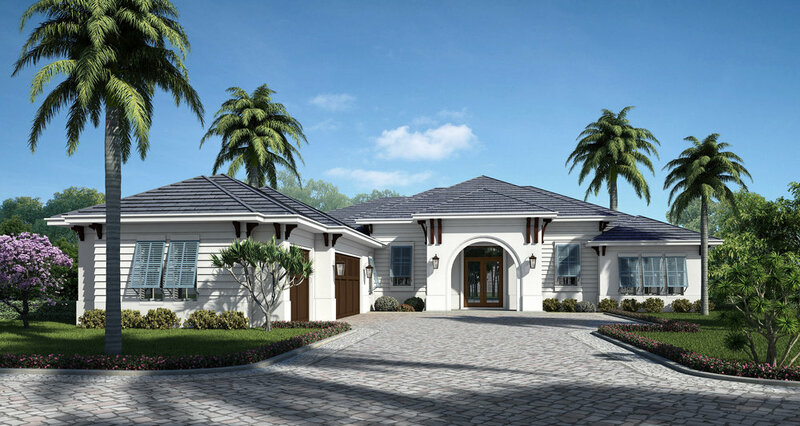 These Coastal and West Indies inspired homes are conceived and constructed by Heritage Builders, Sarasota's premier luxury custom home builder. Whether building on a lot that you own or purchasing one of Heritage Builders' showcase homes, you will receive the service and quality you deserve. For details on our available showcase homes and design/build services please call (941) 328-3272, email info@HeritageBuildersWFL.com or click the link below. The Tortuga by Heritage Builders - Sold! Heritage Builders, Sarasota's premier luxury custom home builder has sold it's Tortuga showcase home on Eastbrook Drive in the exclusive West of Trail area. Situated on a lakefront estate size home site, this sprawling 4,100 square foot lakefront home consists of 4 Bedroom Suites, 4 and 1/2 Bathrooms, 4 Car Garage, Study and Bonus Room. To learn more about this home and our other available West of Trail homes, please click on the link below or call (941) 328-3272 to speak with an associate. You're Invited to an Exclusive West of Trail Celebration! 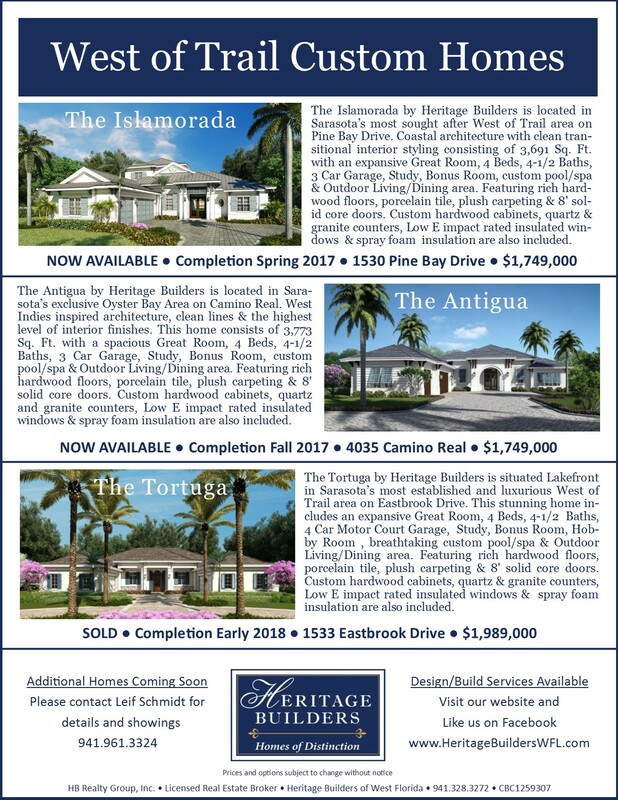 Heritage Builders, Sarasota's premier luxury custom home builder is unveiling The Isalmorada in the highly sought after Sarasota West of Trail Area. Come join us on Thursday May 11, 2017 from 4:00 pm to 7:00 pm for an exclusive completion celebration of this stunning luxury custom home. Available for sale, this 3,691 square foot home consists 4 bedrooms, 4 and 1/2 bathroom, Study, Bonus Room and an expansive Great Room and Dining Area with 10' pocketing sliding glass doors overlooking the custom Pool and Spa. The Kitchen is the centerpiece of the home with custom cabinets, quartz counter tops, over sized island with seating for 4 and Chefs grade appliances. Please RSVP to Info@HeritageBuildersWFL.com or call (941) 328-3272 for more information or to speak with an associate. Heritage Builders' trade partner took "Best Overall" for its pool design at the Abaco model in the 2017 Parade of Homes. This breathtaking pool features sophisticated glass tiles, custom oyster shell coping, linear design, raised spa, fire bowls and fountains. This award complements the "Best Overall" and numerous category awards taken by the Abaco. For more information about the Abaco and to schedule a private tour of this custom home, please call Heritage Builders today at 941-238-3272. Heritage Builders is an award-winning custom home builder in the Sarasota and Manatee areas. 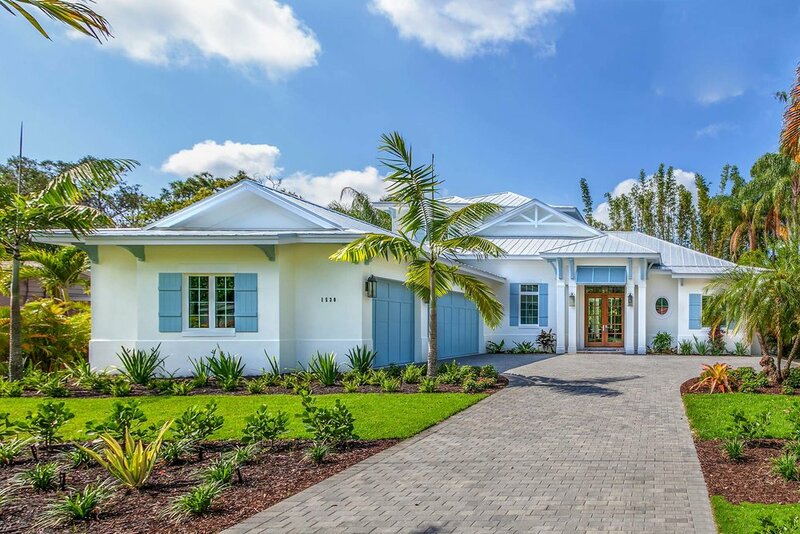 The Abaco by Heritage Builders swept the awards in the Sarasota-Manatee Parade of Homes. This stunning luxury custom home was awarded Best Floor Plan, Kitchen, Master Suite, Curb Appeal, Architectural Detail and Best Overall in it's category for the 2017 Parade of Homes. Situated on a lake front home site in Sarasota's exclusive Oyster Bay Area, The Abaco boasts an expansive Great Room design with over 4,500 square feet of living area. This home also consists of 4 Bedroom Suites, 4 1/2 Bathrooms, Study, Activity Room, and ample Outdoor Living space overlooking the custom pool, spa and sparkling lake. The Abaco will be open Noon to 4pm Saturday March 5th and Sunday March 6th for the final weekend of the 2017 Parade of Homes. To learn more about our available West of Trail custom homes, gated communities or design/build services, please visit us this weekend at The Abaco, speak to a representative by calling (941) 328-3272 or visit HeritageBuildersWFL.com. Heritage Builders is pleased to introduce Sandhill Lake, its latest gated community located in Sarasota, Florida. This private enclave will have just 43 single-family homes and a stylish Residents' Club with heated pool/spa and more. Homes in Sandhill Lake range from approximately 2,500 square feet to over 3,300 square feet. Landscaping and lawn care is provided with each home site, for a low-maintenance lifestyle. Sandhill Lake is located in the Clark Road corridor with easy access to the Gulf Beaches of Siesta Key, shopping at University Town Center, fine dining and I-75 for easy points north and south. Heritage Builders is now taking reservations, with model and quick move-in homes available early 2018. Heritage Builders is pleased to announce the unveiling of West Bay, a private, gated enclave located in Sarasota's sought after West of Trail market. West Bay will feature four custom single family homes, gated entry, lush tropical landscaping and central paver driveway with roundabout. Homes start in the $900s. Please call 941-328-3272 for more information and to join our interest list. The Azalea, Heritage Builders' award-winning model home at Ashton Oaks, is open during for the 2017 Parade of Homes. This breathtaking home sets the standards in Sarasota's new home communities. This striking, designer-furnished residence has three bedrooms, TV Room, three bathrooms, formal dining room, three car courtyard garage, custom pool and spa with travertine deck and Coastal styling. The Azalea is one of just 20 homes in the gated Ashton Oaks community. This private enclave is located in the heart of Sarasota, with easy access to shopping, excellent public schools and fine dining. Please visit the Azalea Monday through Saturday 10am - 5pm and Sundays noon-5pm. The Abaco, Heritage Builders' signature West of Trail model home, is open for viewing Saturdays and Sunday from noon until 4pm Saturdays and Sundays through March 5, 2017. This breathtaking custom estate home is located on a sparkling lake in Sarasota's sought-after Oyster Bay neighborhood, West of Trail in Sarasota. The home features four bedrooms, four and half baths, TV Room, chef's kitchen, four car courtyard garages, great room living, formal dining room, lagoon pool/spa, outdoor fire pit, al fresco kitchen, outdoor shower and more. Please stop by this stunning designer-furnished home located at 1567 Eastbrook Drive, Sarasota, Florida, 34231. Heritage Builders is pleased to announce the completion The Abaco model. The Abaco by Heritage Builders features a clean, island inspired design that encompasses more than 4,500 square feet of living area and is situated on a lake front estate lot in one of Sarasota's most sought after West of Trail areas. The spacious Great Room design boasts 4 Bedroom Suites, 4-1/2 Bathrooms, Formal Dining Room, Study and Activity Room. This luxury custom home showcases elegant details, such as, a hand crafted hardwood entry door, stylish lagoon style pool and spa, sweeping outdoor living area with Summer Kitchen, carpenter trimmed vaulted ceilings, custom American made cabinetry, quartz counter tops and chef's grade appliances. For details, to schedule an appointment to tour The Abaco by Heritage Builders, or for information about our other available West of Trail custom homes, please call (941) 328-3272 or visit www.HeritageBuildersWFL.com.